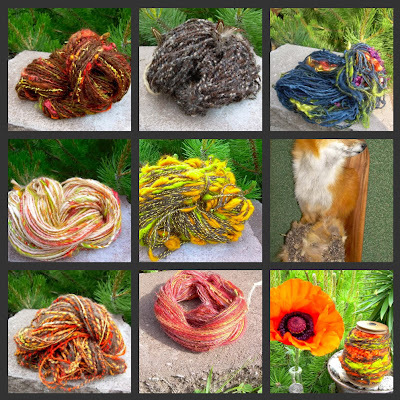 Handspun yarn is more than simply yarn. It is a creative endeavor. It has an intrinsic integrity that is built into the yarn by the very act of spinning. Every inch has been fed through the hand of the craftsperson. Formed. Changed. Created. Thought-through. Felt. There was once a girl who was lazy and would not spin, and her mother could not persuade her to it, do what she would. At last the mother became angry and out of patience, and gave her a good beating, so that she cried out loudly. At the moment the Queen was going by; as she heard the crying, she stopped; and, going into the house, she asked the mother why she was beating her daughter, so that every one outside in the street could hear her cries.The woman was ashamed to tell of her daughter's laziness, so she said, "I cannot stop her from spinning; she is forever at it.." Then Queen answered, "I like nothing better then the sound of the spinning-wheel; let me take your daughter with me in castle - she shall spin there to her heart's content." When they reached the castle the Queen showed her 3 rooms which were filled with the finest flax as full as they could hold. "Now you can spin me this flax and when you can show it me all done you'll have my eldest son for bridegroom!' The girl was inwardly terrified, for she could not spun the flax, even if she were to live to be a hundred years old, and were to sit spinning every day of her life from morning to evening. The girl gazed out of the window...There she saw 3 woman passing by, and the first of them had a broad flat foot, the second had a big under-lip that hung down over her chin, the third had a remarkably broad thumb. They helped girl to spin all flax in well-spun yarn and girl invited them on her wedding. So when the feast began, in came the 3 spinsters...Bridegroom went up to the first spinster and said, "how is it that you have such a broad flat foot?" -"With treading", answered she. Then he went up to the second and said, "How is it that you have such a great hanging lip?" "With licking," answered she. Then she asked the third, "How is it that you have such a broad thumb?" "With twisting thread." answered she. Then the bridegroom said that from that time forward his beatiful bride should never touch a spinning-wheel! Enjoy completely unique texture and colors. so intresting post! I like this story! thank you! Thank you for all this interesting info!! !